Destructible Man: Destructible Man Live in NYC! -- 11/20/09 -- Kevin Geeks Out: Dummy-Deaths! Destructible Man Live in NYC! -- 11/20/09 -- Kevin Geeks Out: Dummy-Deaths! Come one, come all! 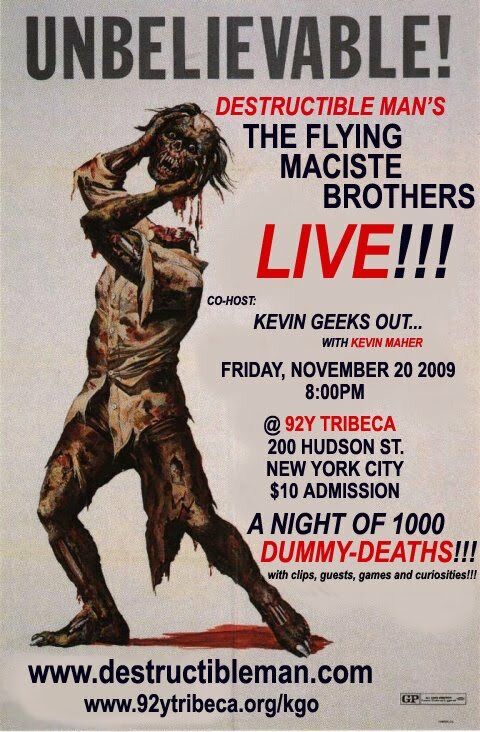 Come on down to 92Y Tribeca on Friday, November 20, 2009 at 8pm to see The Flying Maciste Brothers live! 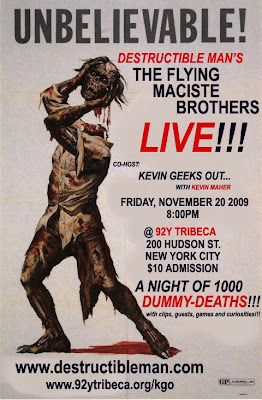 Emmy-nominated comedian and writer Kevin Maher has generously asked the Brothers to co-host and curate an evening of dummy-deathery over at 92Y Tribeca (at 200 Hudson Street -- NOT at the 92nd St Y!!!) as part of his popular ongoing series, KEVIN GEEKS OUT!!! Matt Mitler (with whom Howard had the pleasure of working with back in the day on BASKET CASE 2!) who will screen his dummy-death from 1985's THE MUTILATOR! Director Matthew Glasson screens his film THE FAMILY TIE -- dummy-death included, folks! AND demonstrates what it takes to film a dummy-death on site!! AND -- as a special treat -- A DUMMY-DEATH CUPCAKE BREAK!!! All for $10 at 92Y Tribeca at 200 Hudson Street at 8pm sharp! Time-Out New York has just picked the show as one of Friday nights "Best Bets" so don't be a dummy -- forget about that DEVO concert and get your tickets for "KEVIN GEEKS OUT ON...DUMMY-DEATHS" ASAP!!! The Flying Maciste Brothers WILL be hanging out in the café afterwards to talk dummy-deaths (and have just a general, all-around great time) with everyone who still has a right mind. So a HUGE thanks to Kevin Maher and company for having the imperial good taste and judgment to give us a public forum -- we are sure that they have absolutely no idea of the supernova of simulacracide they have summoned, but we are eternally humble and grateful for the opportunity. And a special thanks to a few fellow bloggers who rallied early on to spread the word -- a couple of whom have promised to be in attendance as well -- namely, the lovely and always insightful Tenebrous Kate of LOVE TRAIN FOR THE TENEBROUS EMPIRE, the acerbic and adjectivorous Arbogast of ARBOGAST ON FILM and the deceptively cherubic but endeavorously trashy Chris Poggiali of TEMPLE OF SCHLOCK!!! Let's see your pretty punims down there Friday and INTRODUCE YOURSELVES -- then, buy us dinner and drinks afterward! Right on! I intend to be there! Check out the recently released on DVD The Lineup (directed by Don Siegel). There's a some good simulcracide (love that word!) towards the end--I don't want to spoil the surprise, so I won't say much. We are looking forward to meeting you, Ivan! Just float over to us afterwards and hang for a while! Spread the word and thanx! WAITAMINNIT NOW! This is truly an embarrassment of entertainment riches. I was already excited about watching an array of mannequin mutilation, and THEN I found out about the cupcakes (which, you should know, helped me pull at least two additional attendees--chicks dig cupcakes). And NOW I learn that the cold hand of mystery known only as Arbogast is going to be in the room as well...! Good grief--I am gobsmacked. Word verification: aleak. As in, my brain has sprung aleak as a result of this massive overload of excellence. Alright, you caught us...Arbogast actually wouldn't even dream of showing up. We just had to lure as many cool, sophisticated readers in as possible. Baiting the old hook with all the false promises that showbiz can muster!!! You need to bring these shows around the country, Barnum & Bailey style!